عالمی, احسان, کلانتر, مهدی, مصلایی پور یزدی, مسعود, قاسمی بنادکوکی, سید صادق. (1395). تولید و مشخصه‌یابی کامپوزیت Al-Mn-Al2O3 تولید شده به روش درجا از طریق ریخته‌گری گردابی در سیستم Al-MnO2. علوم و فناوری کامپوزیت, 3(3), 277-284. احسان عالمی; مهدی کلانتر; مسعود مصلایی پور یزدی; سید صادق قاسمی بنادکوکی. "تولید و مشخصه‌یابی کامپوزیت Al-Mn-Al2O3 تولید شده به روش درجا از طریق ریخته‌گری گردابی در سیستم Al-MnO2". علوم و فناوری کامپوزیت, 3, 3, 1395, 277-284. عالمی, احسان, کلانتر, مهدی, مصلایی پور یزدی, مسعود, قاسمی بنادکوکی, سید صادق. (1395). 'تولید و مشخصه‌یابی کامپوزیت Al-Mn-Al2O3 تولید شده به روش درجا از طریق ریخته‌گری گردابی در سیستم Al-MnO2', علوم و فناوری کامپوزیت, 3(3), pp. 277-284. عالمی, احسان, کلانتر, مهدی, مصلایی پور یزدی, مسعود, قاسمی بنادکوکی, سید صادق. تولید و مشخصه‌یابی کامپوزیت Al-Mn-Al2O3 تولید شده به روش درجا از طریق ریخته‌گری گردابی در سیستم Al-MnO2. علوم و فناوری کامپوزیت, 1395; 3(3): 277-284. In this research, the fabrication of in situ Al-Mn-Al2O3 composite samples from different composition of Al-MnO2 as starting materials have been made by stir casting method. For this purpose, a mixture of Al and MnO2 powders with weight ratio 1:7 was ball-milled. Then 1, 3, 4 and 7wt% of this mixture along with 5%wt Mg (to improve wettability) have been added to melted aluminum at 900 ° C . The disperstion of added materials in molten of Al was made by using graphite stirrer during 8 minutes. The molten of composite was casted into a preheated steel mold. Differential thermal analysis (DTA) was conducted on starting powder mixtures to study the aluminothermic reaction and the possible other reaction or phase changes. XRD analysis and scanning electron microscopy (SEM) were used to investigate the microstructure and phase composition of composite samples. The results show that the final phase composition for all composites is solid solution of Al-Mn, ceramic phase of alumina and MnAl6 intermetallic compound. The amount of MnAl6 and Al2O3 particles in composite samples were increased by adding higher quantity of MnO2 into molten of Al. Moreover there is an optimal amount of MnO2 in which haighest mechanical properties such as hardness, strength and toughness is obtained for composite samples. Reddy, B. S. B. Karabi, D. and Siddhartha, D., “A Review on the Synthesis of In-situ Aluminum Based Composites by Thermal, Mechanical and Mechanical–Thermal Activation of Chemical Reactions,” J Mater Sci, Vol.42, pp. 9366–9378, 2007. Rawal, S., “Metal-Matrix Composites for Space Applications,” MMCs for Space. JOM, Vol. 53, pp. 14-17, 2001. Prasad, S. V. and Asthana, R., “Aluminum Metal-Matrix Composites for Automotive Applications: Tribological Considerations,” Tribology Letters, Vol. 17, pp. 445-453, 2004. Miracle, D. B., “Aeronautical Applications of Metal-Matrix Composites,” Air Force Research Laboratory, pp. 1043-1049, 2001. Suresh, S. Mortensen, A. and Needleman, A., “Fundamentals of Metal- Matrix Composites,” Butterworth-Heinemann, London, 1993. Torralba, J. M. Costa, C. E. and Velasco, F., “P/M Aluminum Matrix Composites,” Journal of Materials Processing Technology, Vol. 133, pp. 203–206, 2003. Mcdanels, D. L., “Analysis of Stress-Strain Fracture and Ductility Silicon Carbide,” Metall Trans, Vol. 16, pp. 1105-1115, 1985. Alpas, A. T. and Zhang, J., “Wear Rate Transitions in Cast Aluminum – Silicon Alloys Reinforced with SiC Particles,” Scripta Metall Mater, Vol. 26, pp. 505-509, 1992. Akbulut, H. Durman, M. and Yilmaz, F., “Dry Wear and Friction Properties of Al2O3 Short Fiber Reinforced Al-Si (LM 13) Alloy Metal Matrix Composites,” Wear, Vol. 215, pp. 170-179, 1998. Skolianos, S. and Kattamis, T. Z., “Tribological Properties of SiC–Reinforced Al-4.5%Cu-1.5%Mg Alloy Composites,” Mater Science and Engineering A, Vol. 163, pp. 107-113, 1993. Sahin, Y. Kok, M. and Celik, H., “Tool Wear and Surface Roughness of Al2O3 Particle-Reinforced Aluminum Alloy Composites,” J Mater Process Technol, Vol. 128, pp. 280-291, 2002. Surappa, M. K. Prasad, S. V. and Rohatgi, P. K., “Wear and Abrasion of Cast Al-Alumina Particle Composites,” Wear, Vol. 77, pp. 295-312, 1982. Sato, A. and Mehrabian, R., “Aluminum Matrix Composite: Fabrication and Properties,” Metall Trans B, Vol. 7, pp. 443-451, 1976. Kwok, J. K. M. and Lim, S. C., “High–speed Tribological Properties of Some Al/SiC Composites.Wear Mechanisms,” Composite Science and Technology, Vol. 59, pp. 65-75, 1999. Kwok, J. K. M. and Lim, S. C., “High–speed Tribological Properties of Some Al/SiC Composites: Frictional and Wear-Rate Characteristics,” Composite Science and Technology, Vol. 59, pp. 55-63, 1999. Sajjadi, S. A. Ezatpour, H. R. and Beygi, H., "Microstructure and Mechanical Properties of Al–Al2O3 Micro and Nano Composites Fabricated by Stir Casting," Materials Science and Engineering A, Vol. 528, pp. 8765– 8771, 2011. Ezatpour, H.R. Beygi, H. Sajjadi, S. A. and Torabi parizi, M., "Microstructure and Mechanical Properties of Al-Al2O3 Micro and Nano Composites Fabricated by a Novel Stire Casting Route," In Persian, 2th Conferences on Application of nanotechnology in Science, Engineering and Medicine, 2011. Ghanaraja, S. Nath, S. K. and Ray, S., “Processing and Mechanical Properties of Cast Al(Mg,Mn)-Al2O3(MnO2) Composites Containing Nanoparticles and Larger Particles,” The Minerals, Metals & Materials Society and ASM International, Vol. 45, pp. 3467-3480, 2014. Maity, P. C. Panigrahi, S. C. and Chakraborty, P.N., “Preparation of Aluminium-Alumina In-situ Particle Composite by Addition of Titania to Aluminium Melt", Scr. Metall. Mater, Vol. 28, pp. 549-552, 1993. Maity, P. C. Chakraborty, P. N. and Panigrahi, S.C., “Preparation of Al-MgAl2O4- MgO In-situ Particle-Composites by Addition of MnO2 Particles to Molten Al-2 wt% Mg Alloys,” Mater Letters, Vol. 20, pp. 93-97, 1994. Henger, C. H. Brimhall, J. L. and Hirth, J. P., “Synthesis of a MoSi2-SiC Composite In-situ Using a Solid State Displacement Reaction,” Materials Science and Engineering, Vol. 155, pp. 109-114, 1992. Ashnagar, M. Mashreghi, A. and Kalantar, M., “Production of Al/(Al2O3+AlxVy) In-situ Composites, Investigation Phase Transformations, Structure and Mechanical Properties,” In Persian, Iranian Journal of Ceramic Science & Engineering, Vol. 2, pp. 57-72, 2013. Wu, J. M. and Li, Z. Z., “Nanostructured Composite Obtained by Mechanically Driven Reduction Reaction of CuO and Al Powder Mixture,” Journal of Alloys and Compounds, Vol. 299, pp. 9-16, 2000. 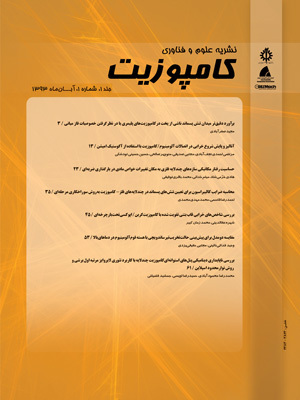 Najarian, A. R. and Emadi, R., “Microstructural Investigation of As Cast Aluminum Matrix Nanocomposite Reinforced by In-situ Al2O3/Al3Ni Hybrid Particles,” In Persian, 5th Joint Conference of Iranian Metallurgical Engineers Society and Iranian Foundry men’s Society,” 2011. Forouzanmehr, N. Karimzadeh, F. and Enayati, M. H., “Synthesis of TiAl-10%wt Al2O3 Nanocomposite Powders by Mechanical Alloying,” In Persian, 2th Student Conference on Nanotechnology, University of Kashan, 2006. Hoseini, M. Ghasemi, S. and Meratian, M., “Fabrication of Aluminium-Alumina In-situ Composite,” In Persian, 10th Congress of the Iranian Metallurgical Society, Ferdowsi University of Mashhad, 2006. Arami, H. Simchi, A. and Seyed Reihani, S. M., “Mechanical Induced Reaction in Al–CuO System for In-situ Fabrication of Al Based Nanocomposite,” Journal of Alloys and Compounds, Vol. 465, pp. 151–156, 2008. Gotman, I. Koczak, M.J. and Shtessel, E., ”Fabrication of Al Matrix In-situ Composites via Self­propagating Synthesis,“ Materials Science and Engineering, pp. 189–199, 1994. Hashim, J. Looney, L. and Hashmi, M. S. J., “Metal Matrix Composite Production by the Stir Casting Method,” Journal of Materials Processing Technology, Vol. 92-93, pp. 1-7, 1999. Shirvani Moghaddam, K. Abdizadeh, H. Bahravandi, H. R. Ehsani, N. Abdi, F. and Fateh, O., “Assessment of Microstructural Observation of Aluminum Composite Reinforced With Three Difrerent Ceramic Reinforcement by Vortex Method,” In Persian, 11th Congress of the Iranian Metallurgical Society, 2007. Mahmoudi, M., “Fabrication of Al-SiC Composite by Mix Casting and The Effect of Magnesium on the SiC Particle Wettability,” In Persian, 11th Congress of the Iranian Metallurgical Society, 2007. Abdulhaqq, A. H. Ghosh, P.K. Jain, S.C. and Ray, S., “Influence of Particle Content and Porosity on The Wear Behavior of Cast In-situ Al(Mn)–Al2O3(MnO2) Composite,” Wear, Vol. 260, pp. 368–378, 2006. Polmear, I. and John, D., “Light Alloys: From Traditional Alloys to Nanocrystals,” Butterworth-Heinemann, 2006. Smith, W. F., “Structure and Properties of Engineering Alloys", McGraw-Hill, 1993. Evanse, A. G. and Wilshaw, T. R., “Quasi-static Solid Particle Damage In Brittle Solid -I .Observation Analysis and Implication”, Acta Metallurgica, Vol. 24, pp.939- 956, 1976. Zaki, M. I. Hasan, M. A. Pasupulety, L. and Kumari, K., “Thermochemistry of Manganese Oxide in Reactive Gas Atmospheres: Probing Redox Compositions in the Decomposition Course MnO2=MnO,” Thermochimica Acta, Vol. 303, pp. 171-181, 1997. Shukla, A. and Pelton, A. D., “Thermodynamic Assessment of the Al-Mn and Mg-Al-Mn Systems,” Jpedav, Vol. 30, pp. 28–39, 2009. Kalantar, M. Mashreghi, A. R. and Solimani, S. M., “Investigation the Influence of Type and Amount of Reinforcement Particles and Processing Parameters on the Micro Structure and Mechanical Properties of Aluminum Matrix Composites,” In Persian, Journal of Metallurgical And Materials Engineering, No. 2, 2010. Vafaie, L. Monshi, A. and Karamian, E., “Investigation of Microstructure, Mechanical and Wear Properties of Nanocomposite Al-5%Cu/SiC Produced by Powder Metallurgy Method,” In Persian, Journal of Advanced Materials and Technologies , Vol. 2, No. 4, pp. 27-34, 2013. Damavandi, E. Nourouzi, S. and Rabiee, S. M., “Effect of Porosity on Microstructure and Mechanical Properties of Al2O3(p)/Al-A356 MMC,” In Persian, Modares Mechanical Engineering, Vol. 15, No. 3, pp. 243-250, 2015. Alizadeh, A. Abdollahi, A. R. and Nasiri, Z., “Compare Microstructure and Mechanical Properties of Al-B4C Nanocomposite Produced by Casting Methods, Stir Casting, Powder Metallurgy and Mechanical Alloying,” In Persian, Advanced Processes in Materials, Vol. 8, No. 1, pp. 243-250, 2014. Baharvandi, H. R. Nasiri, Z. Saeidi, M. and Maheri, H., “The Effect of Particle Size and Temperature on The Microstructure and Mechanical Properties of Al-Al2O3 Metal Matrix Composite Produced by Stir Casting,” In Persian, Advanced Processes in Materials, Vol. 8, No. 2, 2014. Al-Jarrah, J. A. Ray, S. and Ghosh, P. K., “Solidification Processing of Al-Al2O3 Composite Using Turbine Stirrer”, Metallurgical and Materials Transactions, Vol. 29A, pp. 1711-1718, 1998. Baghchesara, M. A. Abdizadeh, H. and Baharvandi, H. R.,“ Investigate of Tensile Strength and Fracture Surface of the Al/ZrO2 Composite Made by Direct Mixing”, In Persian, 2th International Conference and 8th Conference on Manufacturing Engineering, Iran University of Science and Technology, 2007. Arsenault, R. and Shi, N., “Dislocation Generation Due to Differences Between the Coefficient of Thermal Expansion,” Material science and Engineering, Vol .81, pp. 175-198, 1986. Ranjbaran, M. Najafi, M. T. Etaee, M. and Amini, R.,“ Experimental Investigation of Mechanical Failure in the Aluminum Matrix Composites Containing Fifteen Percent Silicon Carbide Particles”, In Persian, Journal of Solid Mechanics, Vol. 2, No. 2, 2009.